Hi there, about a half year ago i’ve started learning about python. First, to lazy to read a book, i’ve watched an online tutorial made by thenewboston. Knowing other programming languages before, the tutorial was slight fare. But thenewbosten has a nice way to teach and video tutorials are a good way to relax and learn ;). If you like to watch that tutorials too, check them out on youtube. After programming a game described below, and some additional server-scripts I think python is quite nice. It’s possible to gain fast results and the way the source code is structured in python grants a smooth read. But i disliked some parts of python too. Injecting self in every method, the missing switch and missing typesafety are only some disadvantages. Also the version chaos distracted me a lot. Major changes in python 3.x broke 2.x programms and although python 3.x is out for a bit (3.0 was released in 2008) most of the librarys where not refactored to run with it. But there are not only diversifications between 2.x and 3.x. py2exe as an example is released to handle 2.5 python programms, while the 2.x branch reached 2.7 a time ago. 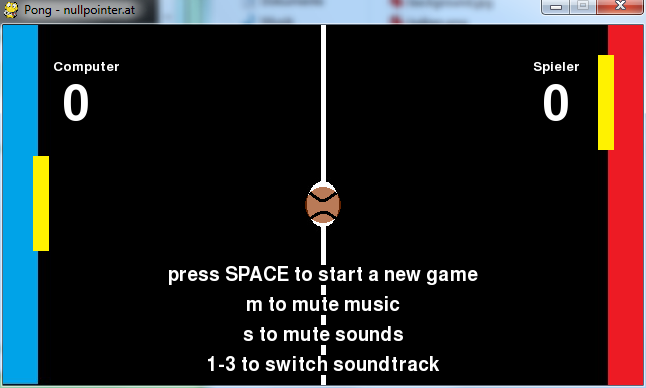 Despite all difficulties, i’ve begun to make a game with python and pygame. There is also video tutorials by thenewboston on youtube to gain some fast impressions about pygame. I liked the online book about pygame developing on http://inventwithpython.com/chapters/ a lot. It offers explainations bout every part of pygame in a detailed way. My first game is a pong clone. Very minimalistic but i gained a lot of experience :) You can only play against a cpu enemy. Sounds where gatherd from http://www.freesound.org – check out the info.txt for exact information what sounds are used.